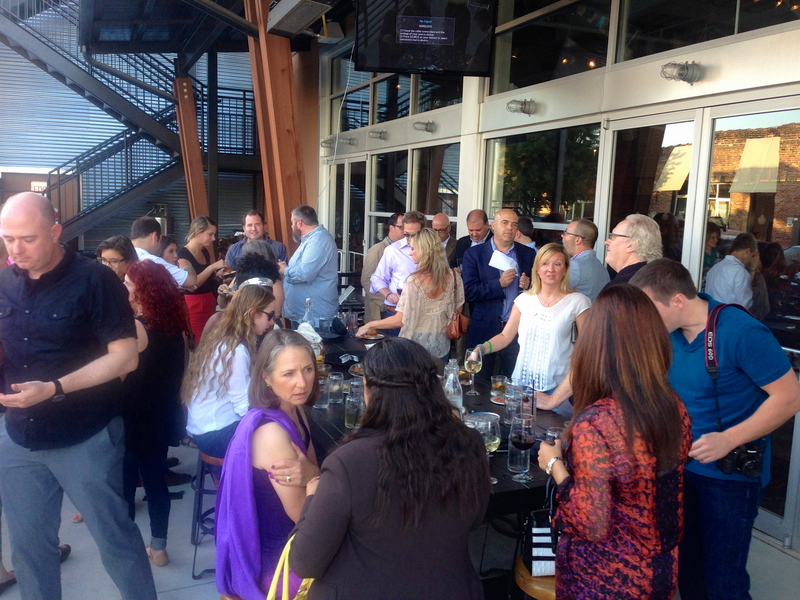 Date Night gets an invitation to Atlanta Eats’ second birthday celebration! They were supposed to have this party at the new Avalon complex in Alpharetta, but it got moved to Bellwoods on the Westside due to “unforeseen circumstances”. This space looks very familiar to us as it used to be West and Mill, which we visited in October of 2013. 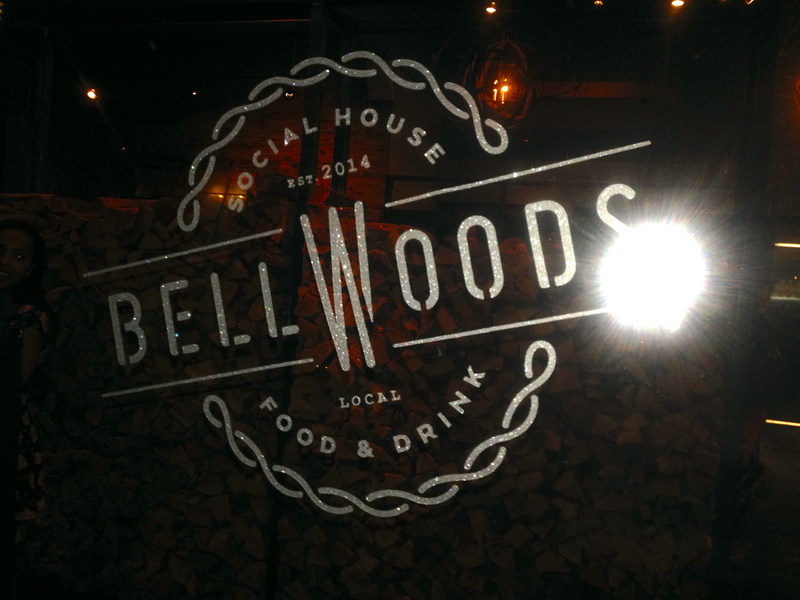 The Bellwoods gang recently bought the restaurant, did a little remodeling and reopened at the end of August. We are here because we recently did an interview with Mara Davis on Atlanta Eats Radio. If you missed it, you can listen here. Scroll down to the August 16, 2014 interview and then fast forward into it about 48 minutes. It was great fun going into the radio studio with the legendary Ms. Davis and talking food. And speaking of food, there are goodies for us to sample tonight as well as some pretty drinks. In honor of Ale Sharpton, who is in attendance and writes the best beer blog in the world, we are presented with a couple of hefeweizens. We fail to find out what beer this is, but it’s nice and enjoyable on a hot night. Ale and just about everyone else is drinking Bellwoods fruit punch, a concoction of vodka, frambroise and lemon. It looks great, but we can never get our hands on one. Bellwoods employs a bunch of mixologists, including Arianne Fielder, who evidently is famous in the Atlanta bar scene. We are sure the cocktails will make you happy if you like that type of refreshments. 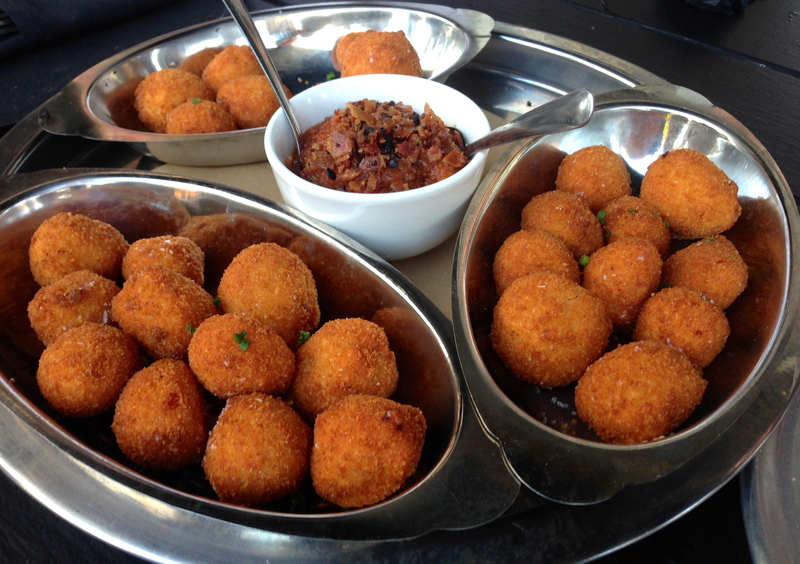 The menu is heavy on small plates. This is the kind of place to go for a drink and a bite. We “bite” into many of them. There are pizzas. There are wings. It’s bar food to go with your mixed drink. 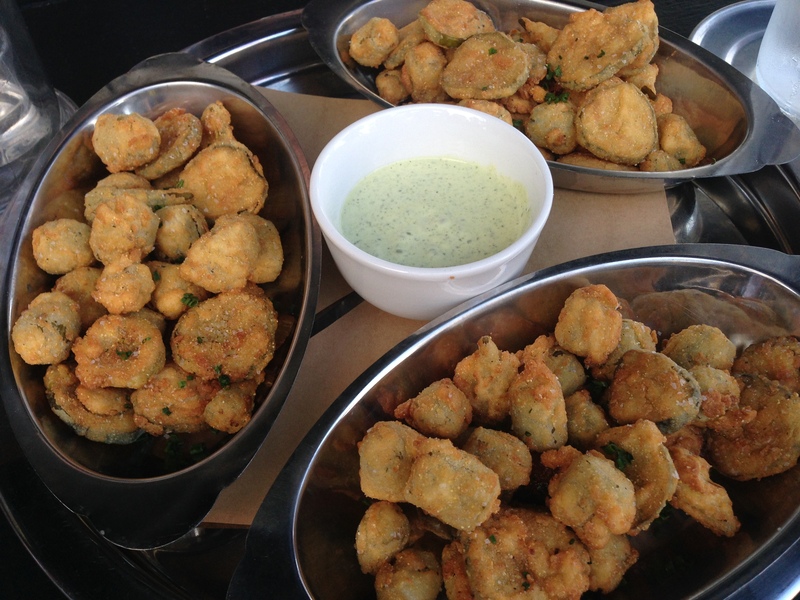 The fried pickles and okra were fun to munch on. The dipping sauce is so “green goddess”. 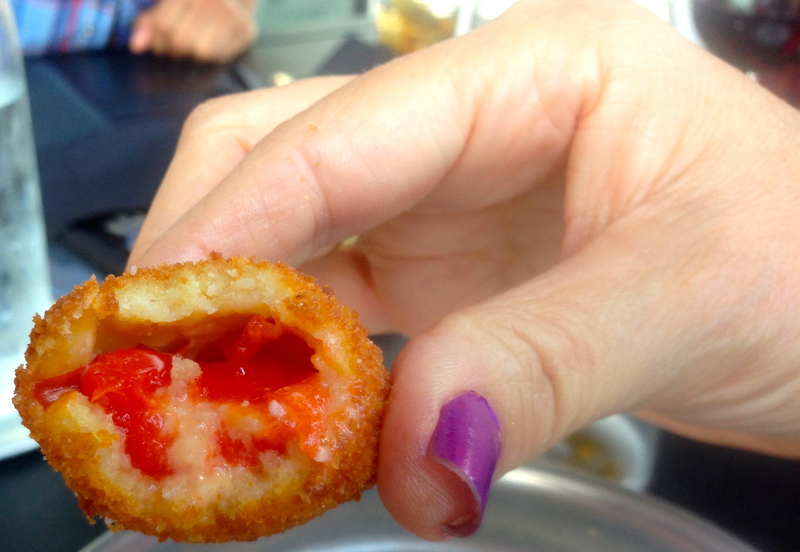 A pappedew pepper is stuffed with pimento cheese and then fried. I don’t love peppers, but the cheese neutralizes the mild pepper’s taste. Eve makes an excellent hand model. 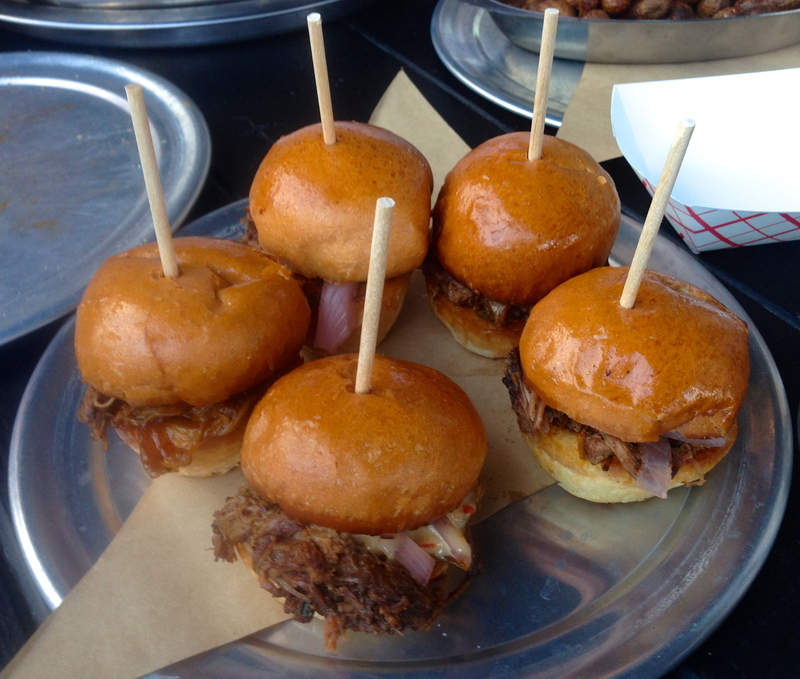 The sliders are full of braised short rib. Throw it on top of a Holeman and Finch bun (the new standard for Atlanta burger buns) and you have a nice few bites. 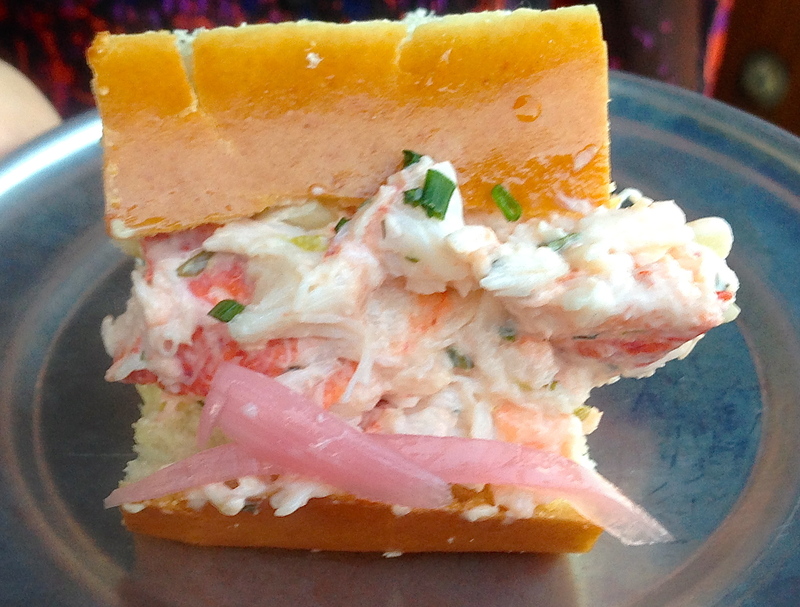 They call it a “lobsta roll”. Keeping with the theme, you get a H+F bun with this as well. It’s full of lobster, which we hear is now cheaper than steak at many restaurants. 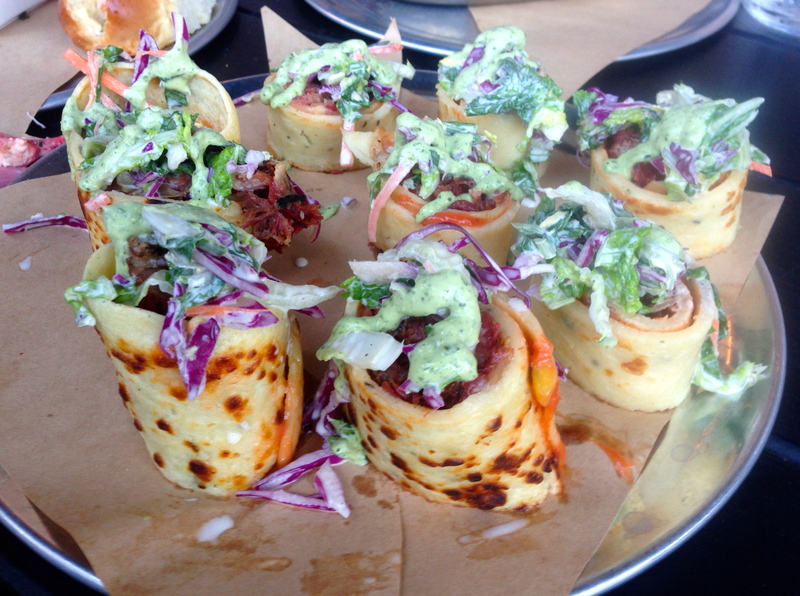 The pastrami rollup was our favorite dish of the night, probably because that pastrami is so good. They make many of their meats on a big green egg, which imparts so much flavor. 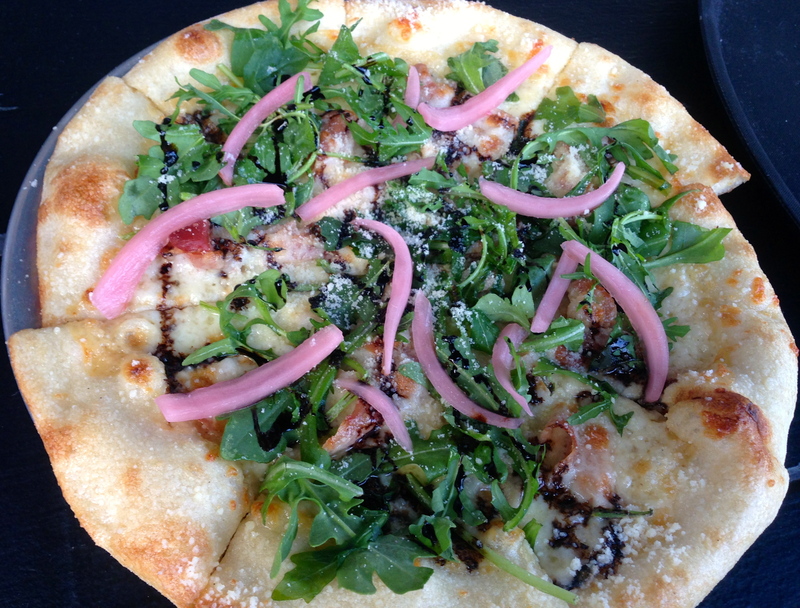 We would definitely order this again. 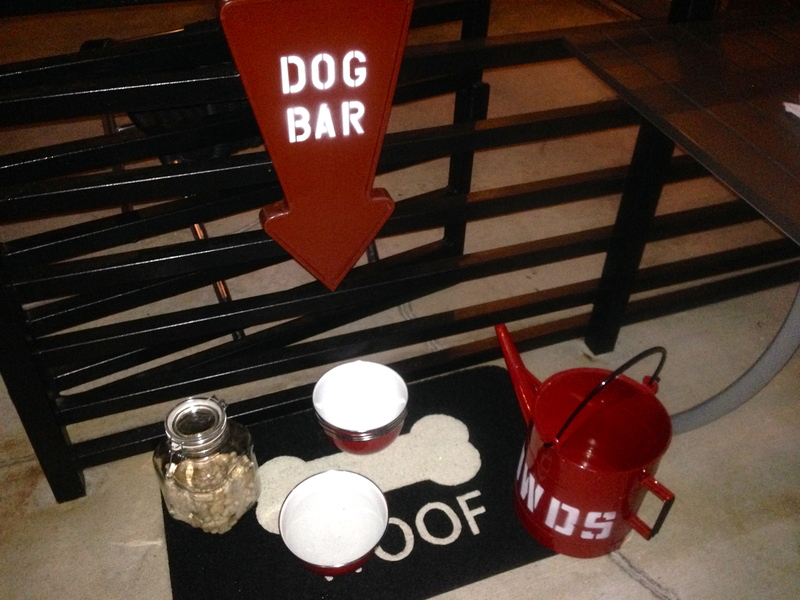 Bellwoods is pet friendly. As we head towards the dog days of summer, you have to like their attitude. We enjoyed our taste of Bellwoods. If you need a beer and a bite on the Westside, go check them out. As for our party hosts, the future is looking bright for Atlanta Eats. On October 4, Atlanta Eats kicks off their fifth season with a show about eating the Buford Highway. They should have called our friend Emily at Spatialdrift, who has eaten in over 100 restaurants in that part of town. Maybe she can be on the radio show before the TV season starts. 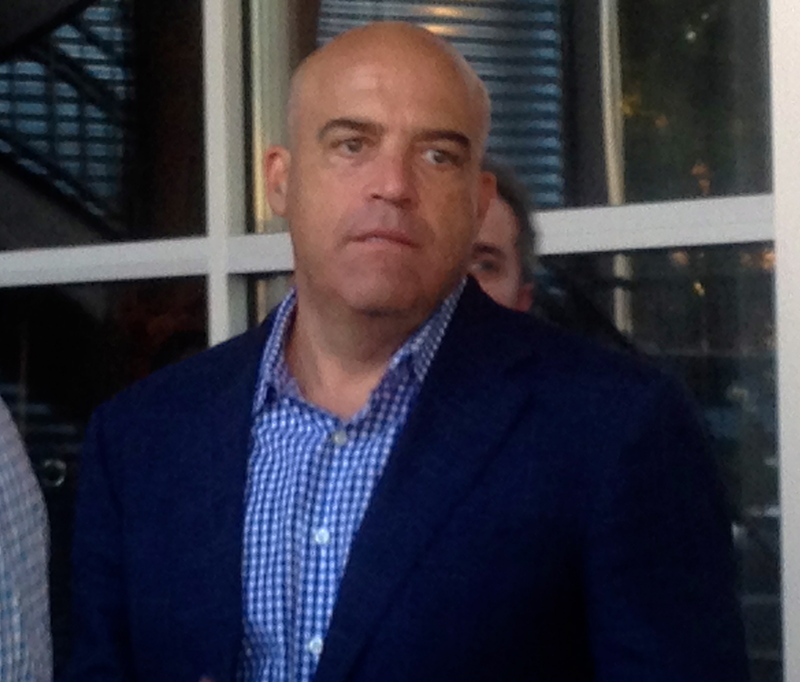 Here’s some big breaking news: Steak Shapiro, the affable host of Atlanta Eats TV, has been selected to be a judge on the new Food Network show “Food Truck Faceoff”. You can watch Steak’s new show beginning on October 2nd at 8PM. 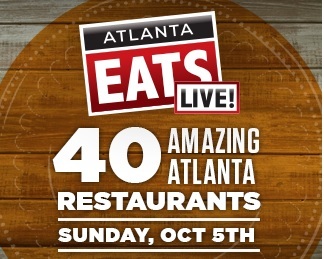 October is a huge month for Atlanta Eats, which also hosts Atlanta Eats Live at the Verizon Amphitheater on October 5. Over forty restaurants will be featured and at $45 a ticket, you can eat your way through the entire festival. Did you say that you would LOVE to have a pair of free tickets to the show? We have you covered! The first person to comment on this post and say “give me the tickets!” will win them. Who will the lucky reader be? Full disclosure: Because we were guests of Atlanta Eats, we did not pay for our food or drink at Bellwoods. Our opinions and prose, however, are priceless. You win, Mark! We will contact you via your e-mail and send you the tickets!